to work and raise a family. I am excited about this election process and the chance to serve the citzens of this great county as Judge." "When I am not working, I value spending time with my amazing family. Meg and I have three incredible children, Andrew Thomas (age 10), Jackson (age 8), and Embrey (age 5)." Vote Andrew Keever for District Court Judge 2014. "The Primary Election Day is May 6, 2014. I ask for your support and most importantly, your vote." Congratulations to Valene Franco and Ted Kazakos for advancing to the General Election. While I am disappointed in the election results, I sincerely appreciate all of the support I received. Thank you to all of my family, friends, and community supporters who helped me at the polls and cast their vote for me. I am motivated to continue to serve this great community. I appreciate all of the voters who recognized my experience, qualities, and dedication to serve. Thank you for your support! As many people have said to me, tomorrow is a new day, and I am not sure what The Lord has in store for me down the road. I do know that I am blessed to have such an incredible family and group of friends that are encouraging me to continue my journey on this path. I hope each of you have a wonderful day, and thanks again for all of your support. Tomorrow is the BIG DAY! Primary Election 2014. All Forsyth County precincts are open tomorrow from 6:30 a.m. – 7:30 p.m. I NEED YOUR HELP!! 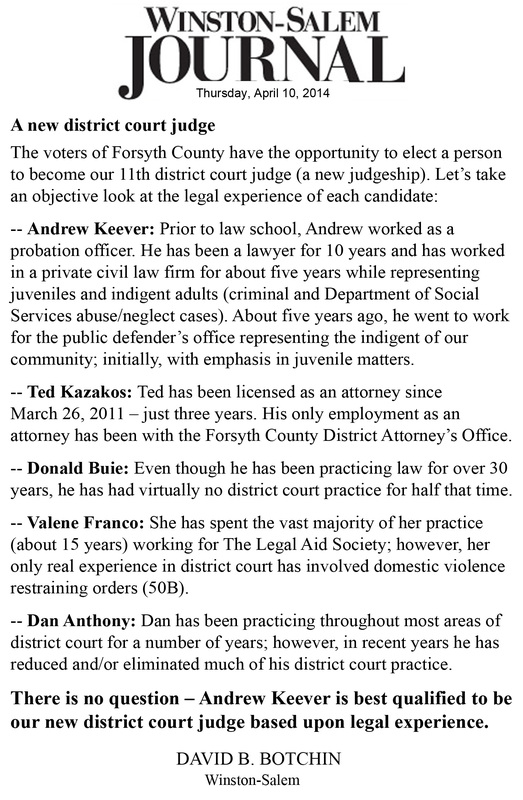 I ask you to contact everyone you know in Forsyth County and tell them to vote Andrew Keever for District Court Judge. I am the best candidate with the right combination of qualities and extensive experience to serve our county as Judge. Please remember to vote and strongly encourage others to vote as well. This election is too important to sit out. While you are out voting tomorrow, please remember that it is the annual Hope Du Jour fundraiser for Crisis Control Ministries. My good friend, Margaret Elliott, is the Executive Director of Crisis Control, and the restaurants listed here: www.hopedujour.org are generously donating 10% of their sales to Crisis Control. Plan your voting around a meal and it will be a win, win for my election and Crisis Control. Thank you for your support! Now go out and vote for me tomorrow! Friends, Family, and Supporters – Early voting starts today and continues through May 6th. I need your help. Will you please take a few minutes to contact your Forsyth County friends, family, and neighbors to encourage them to vote for me as our next District Court Judge? I am the best candidate with the right qualities and experience for this important position. Please contact those you know in Forsyth County and encourage them to vote Keever for Judge. Thank you very much for your help and support! Here is a link to the early voting schedule and locations: http://www.forsyth.cc/elections/Documents/2014PrimaryOnestopSchedule.pdf. All Forsyth County polls will be open for voting on Primary Election Day – Tuesday, May 6th from 6:30 am – 7:30 pm. 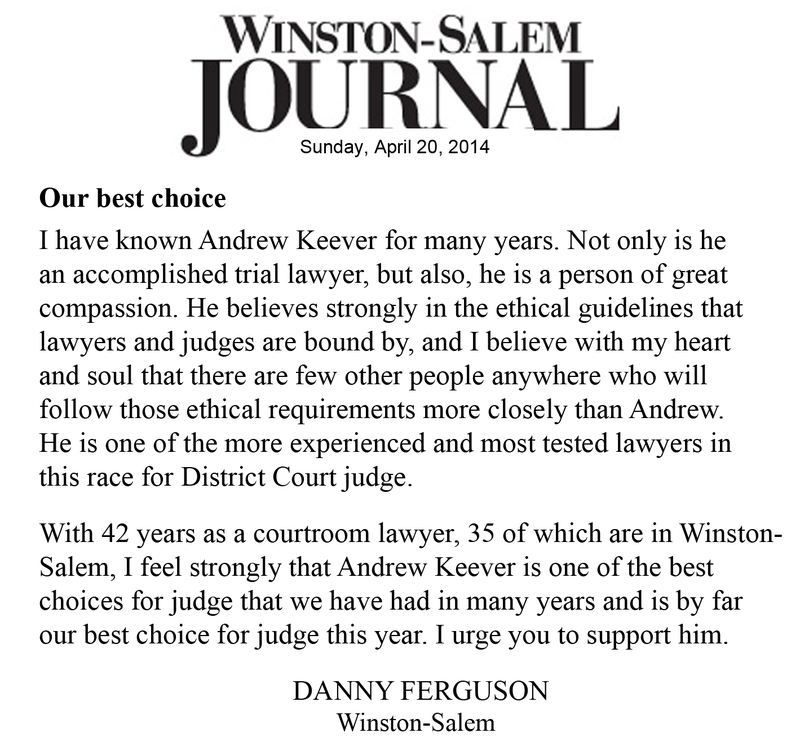 Thank you to attorney and author, Danny Ferguson, for his Letter to the Editor in today’s Winston-Salem Journal. Thank you for your support and endorsement, Danny. Only four days until early voting begins! Please spread the word and encourage your Forsyth County friends and family to vote Keever for District Court Judge. We were happy to brave the wet and cold today to support an amazing event– Lillie’s Friends Festival and 5K. Lillie’s Friends passionately provides families with real hope by raising neuroblastoma awareness, funding innovative research toward a cure, and supporting families experiencing the ‘crisis of belief’ that accompanies their child’s neuroblastoma diagnosis. Neuroblastoma is a rare cancer of the sympathetic nervous system – a nerve network that carries messages from the brain throughout the body. Each year there are about 700 new cases in the United States. It is usually found in young children under the age of five, though it may rarely occur in older children and adults. Thank you to all of the sponsors, volunteers, organizers, Winston-Salem Police Officers and Lillie’s parents and friends for making the event so special and inspirational! Thank you David Botchin for the Letter to the Editor in today’s Winston-Salem Journal supporting my campaign for Judge!